The Outrageous Chicana Presents a Real “Pistolera”! Contact : Theresa Córdova, Ph.D.
Are you wondering what to give your dad for Father’s Day? How about treating him to a unique night of entertainment by world-renowned performers? 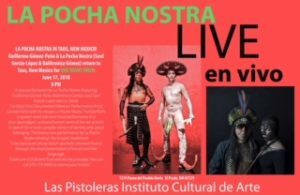 Las Pistoleras Instituto Cultural de Arte (aka Las Pistoleras), 1219 Paseo del Pueblo Norte in El Prado, plays host to performance troupe La Pocha Nostra on Father’s Day, June 17 2018 at 8 p.m. The artists Guillermo Gomez Peña, Saul Garcia Lopez and Balitronica Gomez plan to offer their brand of spoken word and ritual performance while addressing serious issues (including racism, pedagogy and indigeneity) in an entertaining manner. Taos residents and others who attended the Taos Talking Pictures Festival may remember Gomez Peña as one of the performers. Space is limited, and tickets sell on a first come, first serve basis. Admission cost $15 per person and may be purchased through Tessa Córdova or tcordov4@gmail.com.